The harp has given me diverse performing, teaching and composing opportunities within the Classical, pop and folk music worlds on both pedal and lever harps. I have toured extensively giving concerts, workshops, masterclasses and adjudications across North America and in Europe. Some of these include the International Diva Series 3 (Toronto), Ottawa Chamber Festival, 11th World Harp Congress (Vancouver), Celtica and the Workshop Internazionale di Arpa (Italy), Musicora (Paris, France), Festival of the Sound (Parry Sound, ON), Harpcon (St. Louis, MO), Glengarry Highland Games (Maxville, ON), Elora Summer Music Festival, and Vancouver Island Musicfest. My musical partners on many of these adventures have been bass player George Koller, flute and piano player Susan Piltch, accordionist Joseph Macerollo, fiddler Anne Lindsay, hurdy-gurdy/percussionist Ben Grossman and American Celtic harpist Kim Robertson among others. Compositionally, I have been writing and commissioning new works for lever harp across a myriad of Classical, contemporary and folk music idioms. These include works by Canadian composers such as Rodney Sharman, John Beckwith, Evelyne Datl, Kirk Elliott, Susan Piltch and South American harpist Alfredo Rolando Ortiz. My six independent recordings, often heard on CBC and Classical 96.3, feature many of these compositions as well as my own pieces inspired by explorations of South American, Celtic, Classical and contemporary music and my connection with the Canadian landscape. As an educator I teach both lever and pedal harps privately and at Laurier, encouraging students in their creative as well as technical and musical engagement on the harp. I am also a regular instructor for the summer harp retreat weeks at CAMMAC in the Quebec Laurentian mountains and Island Mountain Arts’ International Harp School in Wells, BC. My studies have been with the eminent Judy Loman with whom I received my Classical harp performance degree at the University of Toronto as well as with Celtic harpist Kim Robertson and South American harpist Alfredo Rolando Ortiz. Orchestrally, I am a member of Guelph, Oakville and Kingston Symphonies, among others. I have been guest soloist on both pedal and lever harps with Kingston Symphony, Orchestra London, Oakville, Stratford, Georgian Bay, Quinte, Guelph and Timmins Symphonies. These concerts have frequently included orchestrations of my compositions. 1st place: Lyon & Healy International Pop & Jazz Lever Harp Competition (Tucson, Arizona). 1st place: Concours d'Improvisation de Rencontres Internationales de Harpe Celtique (Dinan, France). the rhyme & the river. Anticipation, with Susan Piltch (flute, piano). 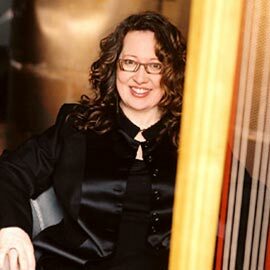 Q&A, with American Celtic harpist Kim Robertson. The Faculty of Music at Laurier is a very warm, friendly, encouraging and dedicated community of faculty and students. Within the harp department we work together inspiring musical and creative growth and awareness in our students through their private lessons, masterclasses and ensemble playing.